Before the real light show starts this Fourth of July, light the way with the patriotic Star Spangled Red Metal Lantern! It's perfect for summer parties! Before the real light show starts this Fourth of July, light the way with the patriotic Star Spangled Red Metal Lantern! It's perfect for summer parties! Lantern measures 4L x 4W x 7H in. 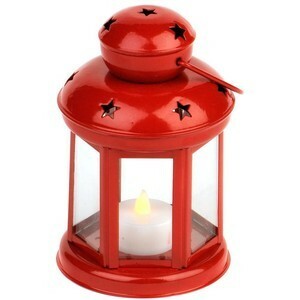 Crafted of metal Red finish Features star cut-outs and one (1) tea-light LED candle Care: Dust with a soft, dry cloth.